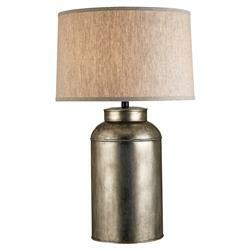 We love the distressed nickel base of this table lamp, whose design is reminiscent of an old time tea canister. The stately piece is topped off with a rustic look beige linen shade for a homey yet elegant touch. A gorgeous on an end table or nightstand, it exudes vintage charm.